The last event during Seminar III brought the VALOR Fellows to a family committed into growing a diversified agribusiness within the Shenandoah Valley region. It was Sunday, January 6, 2013 when our team was hosted by Kern Houff, his brother Neil and Tim Grove at Houff’s headquarters in Weyers Cave, Virginia. Kern Houff and Neil Houff manage the family business with their brother and brother-in-law. Kern is a 1975 graduate of Virginia Tech and is Vice-Chairman of the VALOR Advisory Council and a board member on the Virginia Agribusiness Council. Neil, a 1985 Tech alumnus and his brother Kern both earned a degree from Virginia Tech in Agriculture Education. Tim Grove, a native of the Shenandoah Valley, is a graduate from Virginia Tech in Crop and Soil Environmental Sciences with a minor in Agricultural Economics. Tim began employment with Houff’s right after graduation in 1998. It became apparent during our short visit that this family business offers a variety of services that grew out from the initial fertilizer business that began on a production dairy farm in the mid 1970’s. Over time, Houff’s Feed & Fertilizer grew in both size and scope as other services were added. 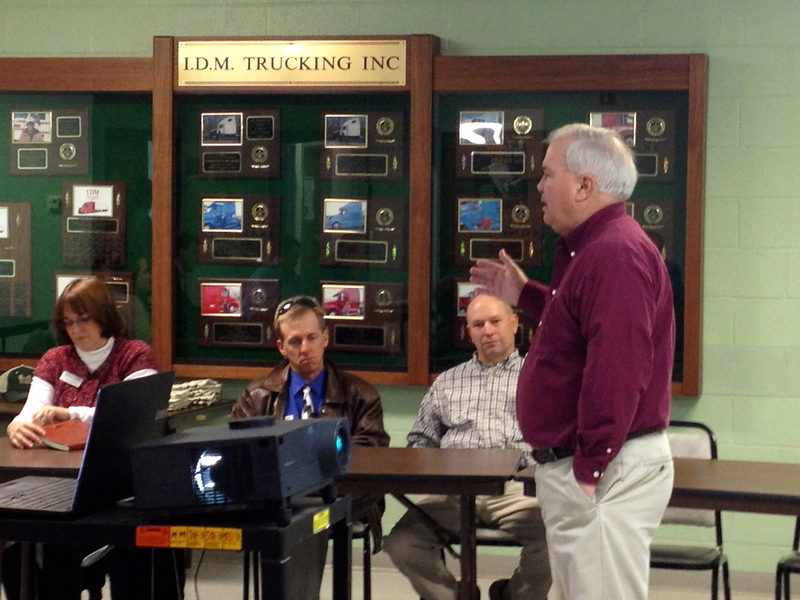 Today, the Houff brothers manage additional businesses such as IDM Trucking and Blue Ridge Petroleum. Although these businesses are independent on paper, the employees and equipment that support the sales, service and logistics of product are administrated by the parent company Railside Enterprises. The success of this business does not just lie in the hand of the Houff family but in part with the employees. The Houff’s family businesses currently employ 110 people with 21 million in annual sales. As an Employee Stock Ownership Plan (ESOP) company that is 25% employee-owned, management and employees alike share the success from business growth and quality service. VALOR enjoyed the personal tour and discussion that followed regarding the expanding businesses managed by the Houff brothers. For that chance to mingle with members of a successful family business, we say Thank You. Before we left Seminar III to return to our own business, we had the opportunity to learn about accomplishments and challenges encountered by several farm-based family businesses. I have concluded that all agribusinesses, big and small, face daily obstacles with government regulations, economic resources and public relations. Thus, it is critical for all who have a stake in the production of food, fiber or energy should embrace its diversity. The American Agribusiness Story will continue so long as VALOR is engaged in defending the unique quality and need for both large and small agribusinesses. VALOR appreciates the Houff brothers and Mr. Grove for taking the time to share their American Agribusiness Story with us. You can find me on Facebook at Facebook.com/hunter.b.richardson. Follow me on Twitter at @plainviewfarmer. Previous postValley Seminar III: Day One Revealed! Great post Hunter! Thanks for sharing your experience.